Several years ago my life was a mess, despite ambition and a strong work ethic, I saw little to no results. With hindsight my priorities were out of order I was volunteering for an environmental charity where I was focused on trying to make the world better. This was not making life better and I was a burden to those who loved me the most. This made me realise there is no point trying to change the world when I can’t even change my own life. The next day I quit working for the charity, vowing to sort myself out. Step Two: Improve your family’s standing in life. Step Three: Impact your community. Step Four: Impact your country. Step Five: Change the world. I called this the priority stair theory. More focus on things that have the greatest impact on me. A greater perspective on life, not worrying about things outside of my control. 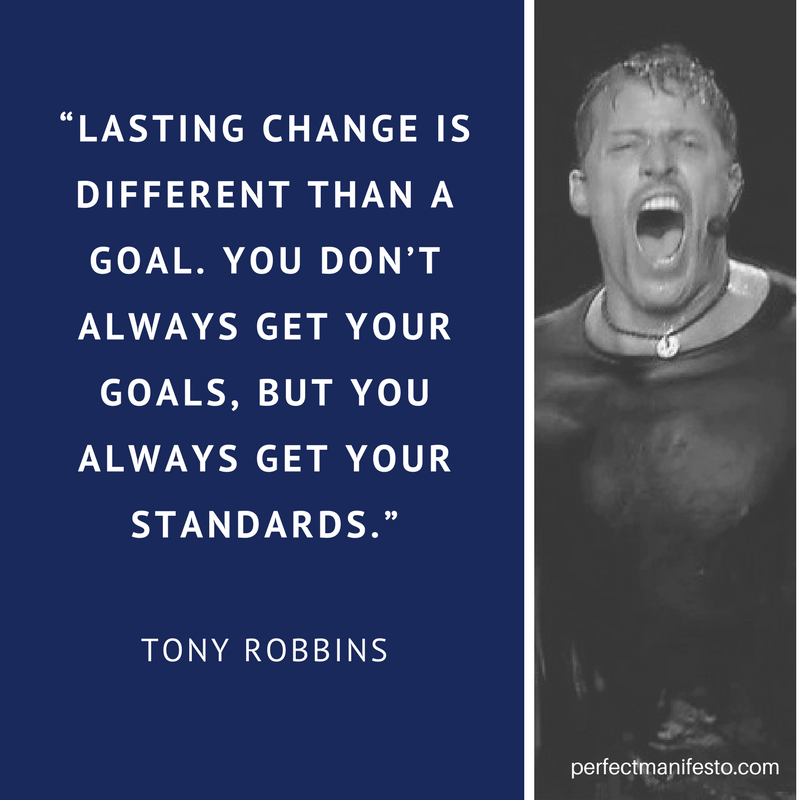 If you want to get your life in order I recommend following a similar system, starting with step one – change yourself. When I originally took this approach I felt selfish, but quickly notice that those I loved benefited from my successes. By caring more about myself I was actually less selfish – no longer was I the manchild liability. As I grew to like me, so did everyone else who put up with me. How do I implement the step system? Financially secure – Live comfortably and not be in debt. Make my own decisions – Be free to make my own choices and take full responsibility for them. Independent – Be able to drive and free to go where I like. Confident – Develop my social skills so I can maximise opportunities in life. Lifestyle – Make good choices and develop good habits (do not rely on consumerist impulses to feel good). To progress, you need to meet the criteria you set for each level then you can start to include activities that you view as important for the next step. When that has been met starting doing things for the next step and so on. You will find as you move further up your level of influence decreases as apart from step one where we are 100% responsible for our actions, all the others become further and further from our zone of control. Don’t get me wrong, have a healthy interest in wider issues but don’t let it possess you to a level that you lose focus on the first step. You shouldn’t consider going beyond early steps if these are not in order. No matter how far you get, keep prior stages in mind as you should always make time to keep working on yourself. Neglecting earlier stages could result in a fall where you would need to build yourself up again – a lot harder than keeping it maintained! Again totally subjective, to change the world I would have to be either a billionaire and/or a global public figure. I have a family, but have not achieved stage one – so what you’re saying is I should ditch them to focus on myself? 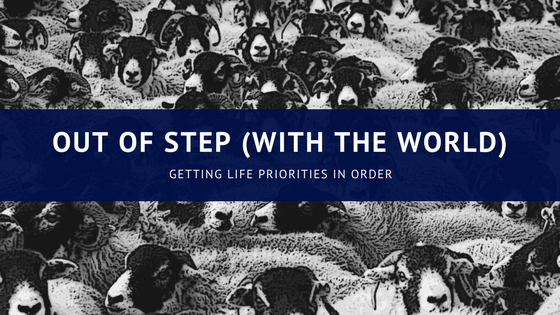 Not at all – in an ideal world you should ditch any commitments that fall out of stage one remit, but I recognise that I had the luxury of only having myself to rely on. If you have children you already have stage two commitments, it’s not ideal and will make step one harder but don’t neglect them with the excuse you need to work on yourself. 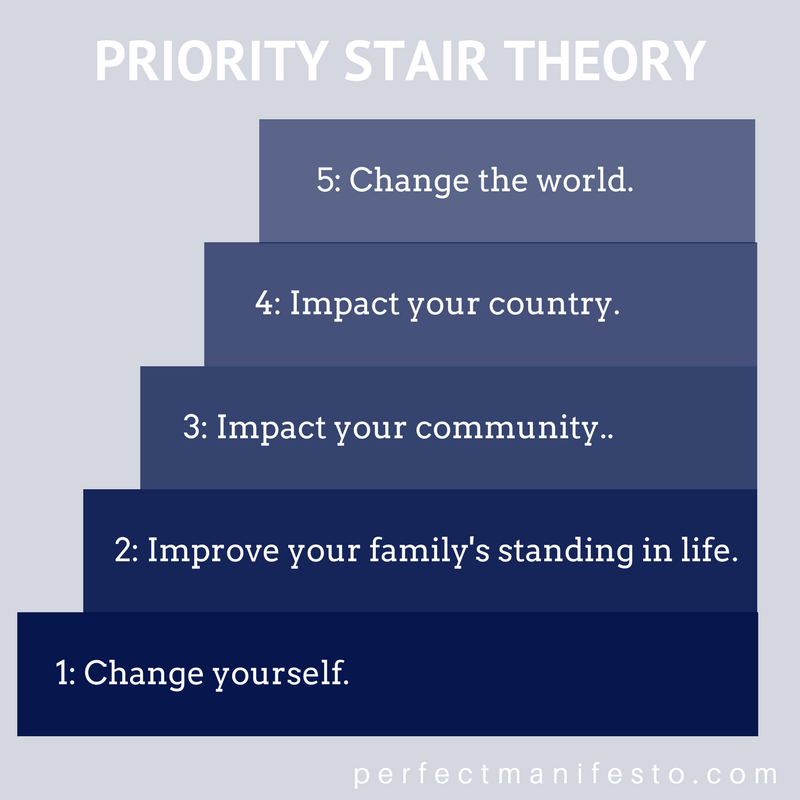 I fully buy into the priority stair theory because by focusing on myself I have built my life up to create things I have never had before. “Set your house in perfect order before you criticize the world”. That last point is perfect.